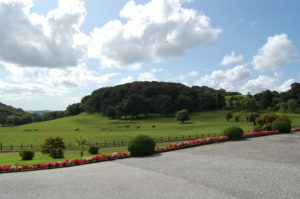 The Prideaux/Pridias family had a manor house at the base of the Prideaux hill fort since prior to the Norman invasion. The dwelling was knocked down and rebuilt in an improved style many times. 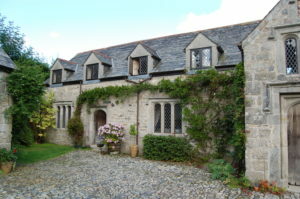 The ancient manor originally comprised Great and Little Prideaux, Lestoon, Levrean, Rosemullen, Trevanney, Trenince, and Ponts Mill in Luxulyan. Stenalees in St Austell, Grediow in Lanlivery, Biscovay in St Blazey, Carroget, Kilhalland, Rosegarth and Penpillick in Tywardreath. Gubbavean in St Issey, Nanscowe in St Breaock, and moieties in Golant, one of which was called Bakers. I have a description of the manor house in some of my documents. Of the ancient seat of the Herles, which within memory formed a complete quadrangle, the eastern side only remains. This portion was built early in the fourteenth century by Thomas Herle, who was one of the stannators of the stannary of Blackmore, 22 James 1. 1624 and 12 Charles 1, 1636. It comprised a large and handsome hall, with a carved roof and armorial bosses shewing the marriage connexiots of the family and one or two inferior apartments. Over the chimney of one of the upper rooms the story of Perseus and Andromeda was represented in plaster, this with the stone stairs that led to the sleeping apartments have been removed. Over the chief entrance is a shield of twelve quarterings, surmounted with the crest of the Herles. As the house originally stood intact, it was a venerable and interesting structure. 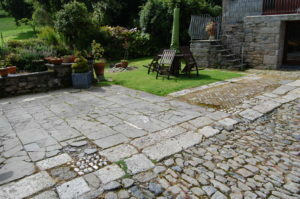 Within the quadrangle was a well of excellent water and the only entrance which led direct to the north was from the north, which was so constructed as to appear to pass through a wall ten or twelve feet in thickness. 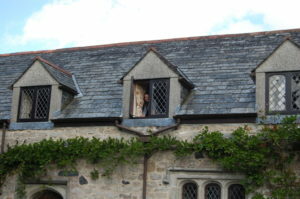 The south and the west portions of the house were the most ancient, two of the upper rooms of which contained the arms of Prideaux, with quarterings and the family motto – In God is All. From the Historical Survey of the County of Cornwall of 1820. 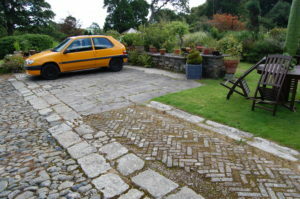 Luxulian, although wild and desolate in its general aspect, affords considerable matter for the entertainment of the tourist, namely its ancient church, two moveable stones called Logan Rocks, the venerable mansion, and decayed fortification called Prideaux Castle, and the singularly rocky valley, which opens and folds itself with astonishing grandeur through the country below. The church is seated in moderate eminence, and with its tower, is built of wrought granite. The Gothic walls of the porch are embattled, and the ceiling very curiously ornamented. On the front over the arch, are the ancient arms of Prideaux……..
Prideaux Castle, the original seat of the Prideaux family, is supposed to have stood on an elevated spot, which has now the appearance of an ancient encampment. 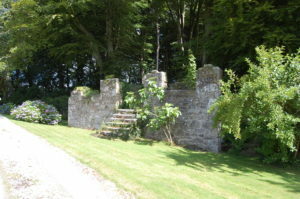 At a small distance on the northern side of these remains, is seated Prideaux House, which seems to have been built by the Herles, and their arms are still over the entrance. It is a rude quadrangular building, the apartments low and gloomy, and the stairs throughout are formed of moorstone. 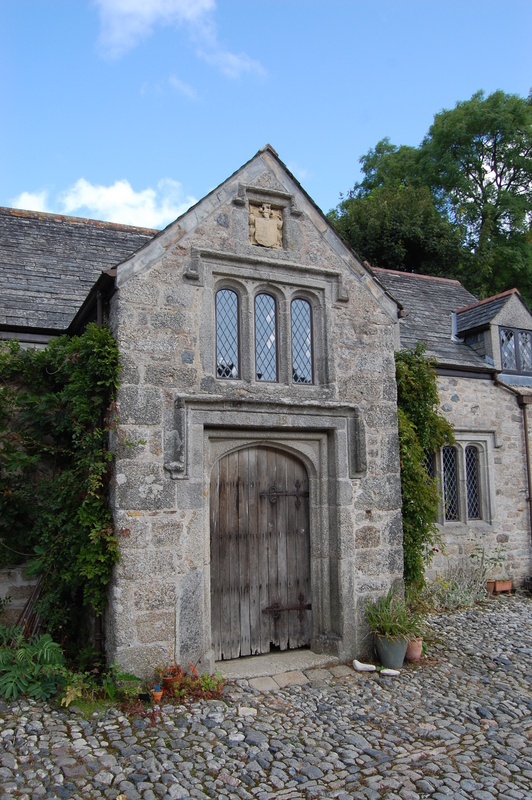 The hall, which is now used as a stable, is ornamented with shields of armorial bearings, cut in oak, and shew the marriage connexions of the Herles, during their residence at this place. The upper apartments exhibit some curious plasterwork, and on one of the chimney pieces is represented Perseus riding to the relief of Andromeda, who is represented chained to a rack, with a sea monster swimming towards her. Medrose present house was built by the Kendalls. The hall is lined with oak, and has very curiously carved chimney piece, adorned with large human figures, and a variety of armorial bearings. 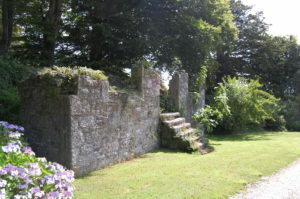 A little to the east of Prideaux Castle, stands the handsome modern mansion of John Coleman Rashleigh, esq. The best front has a southern prospect, and a coach road is carried through the grounds by an easy descent, into a small valley, which enters the great western road, at St. Blazey church town.